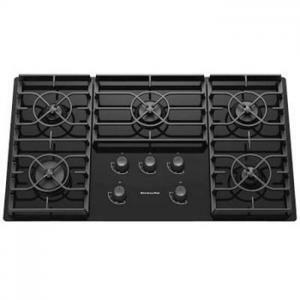 The KitchenAid 36-inch gas cooktop has a ceramic-glass surface that looks stylish in many kitchens. The easy-to-clean surface features full-width cast-iron grates that allow you to slide cookware across the surface without lifting. In addition, the powerful burner options range from 6,000 to 17,000 BTU allowing you to get exceptional results for simmering a sauce or searing a steak.